The children also moved up front and made their offerings before the drama began. 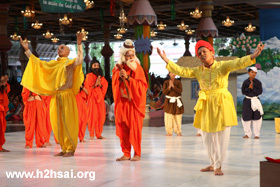 It started with an introductory dance that stated the fact that Maharashtra had been blessed by saints and godmen galore. The presentation would examine the inspiring life of one such man of Godc - Sri Gajanan Maharaj. The place is Shegaon. Shri Gajanan Maharaj first appeared at Shegaon on the 23 February, 1878, as a young lad. Bankatlal spots the saint eating leftovers abandoned on the road side and growing inquisitive, questions the saint about his identity. Gajanan Maharaj asks him to find the answer to the question, "Who am I" first. Interesting anecdotes from his illustrious life were shown depicting the transformation he brought about in individuals bringing in societal transformation. When an enraged villager showers abuse on him at his laziness to fetch water in times of drought, the saint fills a dry well nearby to the brim with water. In two incidents, the Maharaj shows his spiritual powers to bestow the boon of liberation on his chosen disciples, Bhaskar and Peetambhar. Bhaskar is bitten by a rabid dog and he sees no other doctor but his master. Gajanan maharaj burns away all his karmas in a matter of two months and grants ultimate freedom to him. Peetambar, on the other hand, is told by the master to go away from Him for he had to spread His message. Peetambar realizes that he is a mere instrument and when asked to prove that he is not a thief but a genuine seeker, he brings to life a dead tree through the sheer power of prayer. A self styled Brahmajnani, challenges the master into a debate in the Gita. Maharaj creates a fire surrounding Him and tells the arrogant man, "Come in, for the Gita says that fire can't burn me, nor water wet me." The man immediately falls on His feet and begs pardon. Visiting an evolved soul in neighboring village, Gajanan Maharaj would often get into spiritual discussions and even advised the householder devotee, who was very much evolved, that, despite following grihastha dharma ( the life of a householder) one could still reach the exalted state of spiritual ecstasy. The master attained merger with his Lord Vitthala chanting His favourite mantra, "Gani Gana Ganath Bothey"
The drama was touching in so many aspects. The foremost was the fact that seeing the drama, one could easily identify the incidents depicted with one's own life with Swami! The chant "Gani Gana Ganath Bothey" was so catchy and elevating that whenever it came up (and it came up regularly) one found oneself chanting along! The inspired words spoken by the saint on many occasions left no doubt in every heart as to who was the inspiration behind those words and one could not help but gaze at beloved Swami with tear-filled eyes. Hats off to the organizers who made painstaking visits to the village Shegaon to collect matter and feel the pulse of the saint before presenting it before Swami. Bhagavan too seemed quite absorbed in the play and as it concluded, agreed to move down the stage to grant group photographs. 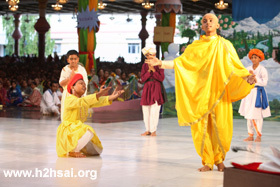 The boy acting the role of the saint moved up the stage and offered the text of the holy life of Gajanan Maharaj to Swami. Bhagavan flipped through the pages of the book, paying particular attention to the picture of the saint. Then, He blessed the child and sent him down. As He was moving down, He looked at a student on stage and said, "The drama was very nice." He appeared so moved at the effort of the children. He not only granted them group photographs, but also moved amidst them collecting letters and talking to them. He asked one little girl what her name was. She replied, "Mirabai", which was her role in the drama. Swami smiled, for it appeared as if He had asked for her name in the drama of life! 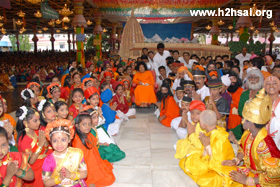 Many of the children were in tears and Swami seemed to be telling them not to weep! He then moved through the boys actors' area and granted them blessings too. Finally Swami moved up the stage and blessed the prasadam to be distributed. As Swami returned to the car, the Youth team members from the state had an opportunity to show a presentation on the various Youth Awareness programmes conducted across the state. They also detailed Swami as to what entailed in the service activities for the 114 adopted villages in the state. In a village where drinking water facility was scarce, getting potable water once in seven days, Sai Organisational units initiated sending drinking water; taking a cue from this noble deed, some other organizations also joined the activity making it a full week drinking water scheme, much to the joy of the villagers. 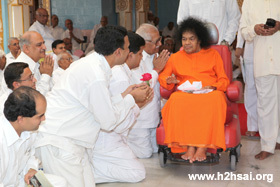 Sathya Sai Seva Organisation’s (Maharashtra) upcoming website was also shown to Bhagavan seeking His Divine Blessings. It also happened to be the last day of service for Swami's security guards of the month. Swami blessed them too with a group picture at Yajur Mandir before retiring for the day.